Greetings again from New Hampshire! It seems fitting that my NOAA Teacher at Sea blogs are bookended at home in cooler 55 F rainy weather. The garden is in and looking forward to the hot sun that will follow. Is there a correlation between oxygen and fluorescence? How does depth correlate to sound velocity? How big are the differences in temperature? What is the variability of fluorescence? How does the temperature change as you go deeper in the water? How does salinity between shallow and deeper parts vary? Is there a correlation between pressure and salinity? Is there a correlation between depth and density? The amount of data out there can feel overwhelming sometimes. There is a greater need than ever before to know how to sift through information and critique it. Giving students constant opportunities to practice how to interpret data is important. This process also connected the information they learned from the blog posts to the next step in science research. Once the data is collected, it needs analysis and interpretation. The ability to critically analyze information is vital to an informed citizenry. I’ve been back home for almost two weeks and it’s been back to the end-of-school groove. Sometimes it feels surreal that recently I was on a real working fisheries vessel. I have taken solo trips before so I know the feeling of going through a unique experience only to return home to everyone just normally moving forward as life does. It can feel a little jarring. This one felt even more so even though I was in contact the whole time. It was great getting questions and comments in person. I was happy to hear people from age 6 to 96 were following along when I was away. I am not naturally a journaler, but I appreciate the ability to reread my own experiences later. It will also provide a tool for my teaching. The week I returned to school was Spirit Week. It happened to be character day when I was asked to speak to the School Board about my NOAA Teacher at Sea experience. 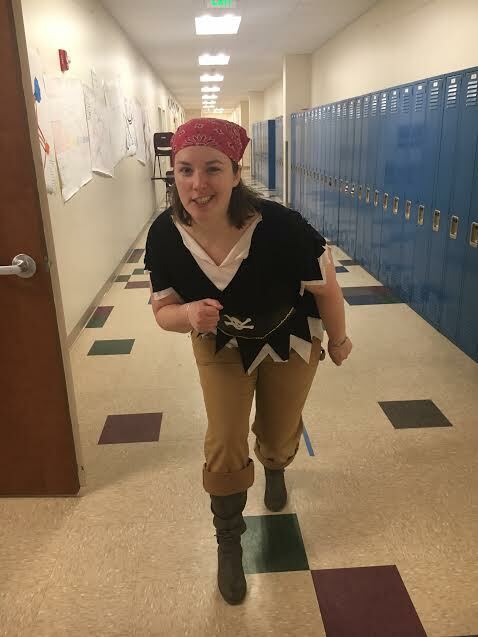 Not everyone can say they have talked to their School Board about their time at sea, while dressed as a pirate. Of course, the experience is not over. I still have those lesson plans in the works and there are other loose ends to tie up (such as this final post). I also look forward to continuing through the network of NOAA Teacher at Sea alumni. NOAA is such a rich resource for science and science learning. I am very thankful for the opportunities NOAA Teacher at Sea has afforded me as a science educator and to the crew and science team from my time on NOAA Ship Pisces. Teacher at Sea has accepted teachers from all 50 states, American Samoa, Puerto Rico, and Guam since 1990. Interested? Any full time pre-K-12 teacher; community college, college, or university teacher; museum or aquarium educator; or adult education teacher may apply. There are two sensors for most readings and the difference between them is shown in real time and recorded. For example, the dissolved oxygen sensor is most apt to have calibration issues. If the two sensors are off each other by 0.1 mg/L then something needs to be done. Software programs filter the data to cut out superfluous numbers such as when the CTD is acclimating in the water for three minutes prior to diving. Another program aligns the readings when the water is working through the sensors. Since a portion of water will reach one sensor first, then another, then another, and so on, the data from each exact portion of water is aligned with each environmental factor. There are many other sophisticated software programs that clean up the data for use besides these two. These readings are uploaded to the Navy every twelve hours, which provides almost real-time data of the Gulf. The military uses this environmental data to determine how sound will travel through sound channels by locating thermoclines as well as identifying submarines. NOAA describes a thermocline as, “the transition layer between warmer mixed water at the ocean’s surface and cooler deep water below.” Sound channels are how whales are able to communicate over long distances. The transmissometer measures the optical properties of the water, which allows scientists to track particulates in the water. Many of these are clay particles suspended in the water column. Atmospheric scientists are interested in particulates in the air and measure 400 m. In the water, 0.5 m is recorded since too many particulate affects visibility very quickly. This affects the cameras since light reflecting off the clay can further reduce visibility. Fluorescence allows scientists to measure chlorophyll A in the water. The chlorophyll molecule is what absorbs energy in photosynthetic plants, algae, and bacteria. Therefore, it is an indicator of the concentration of organisms that make up the base of food chains. In an ecosystem, it’s all about the little things! Oxygen, salinity, clay particles, photosynthetic organisms, and more (most we can not actually see), create a foundation that affects the fish we catch more than those fish affect the little things. The relationship between abiotic (nonliving) and biotic (living) factors is fascinating. Oxygen is a great example. When nitrates and phosphates wash down the Mississippi River from the breadbasket of America, it flows into the Gulf of Mexico. These nutrients can make algae go crazy and lead to algae blooms. The algae then use up the oxygen, creating dead zones. Fish can move higher up the water column or away from the area, but organisms fixed to the substrate (of which there are many in a reef system) can not. Over time, too many algae blooms can affect the productivity of an area. Salt domes were created millions of years ago when an ancient sea dried up prior to reflooding into what we have today. Some salt domes melted and pressurized into super saline water, which sinks and pools. These areas create unique microclimates suitable to species like some mussels. A microclimate is a small or restricted area with a climate unique to what surrounds it. The ship’s sonar revealing a granite spire a camera array was deployed on. Another great example is how geology affects biology. Some of these salt domes collapsed leaving granite spires 30-35 meters tall and 10 meters across. These solid substrates create a magical biological trickle down effect. The algae and coral attach to the hard rock, and soon bigger and bigger organisms populate this microclimate. Similar microclimates are created in the Gulf of Mexico from oil rigs and other hard surfaces humans add to the water. Jillian’s net also takes a ride with the CTD. She is a PhD student at Texas A&M University studying the abundance and distribution of zooplankton in the northern Gulf of Mexico because it is the primary food source of some commercially important larval fish species. Her net is sized to capture the hundreds of different zooplankton species that may be populating the area. The term zooplankton comes from the Greek zoo (animal) and planktos (wanderer/drifter). Many are microscopic, but Jillian’s samples reveal some translucent critters you can see with the naked eye. Her work and the work of others like her ensures we will have a deeper understanding of the ocean. Prior to this I had never been to the Gulf of Mexico other than on a cruise ship (not exactly the place to learn a lot of science). It has been unexpected to see differences and parallels between the Gulf of Mexico and Gulf of Maine, which I am more familiar. NOAA scientist, John, described the Gulf to me as, “a big bathtub.” In both, the geology of the area, which was formed millions of years ago, affects that way these ecosystems run. Zooplankton in the Gulf of Mexico are smaller than zooplankton in the Gulf of Maine. Larger species are found in colder water. The whale legging were good luck. When the Bandit reel lines go down, it becomes a fun game to guess what, if anything, is going to come up. Even at their shallowest, we are dropping thirty baited hooks (ten per reel) down 50 meters, deep enough to not see any action going on. Many times these vertical long lines are dropping over 100 meters to the seafloor. There is a lot more radio communication than you might expect when we fish. Today, scientists Joey and Kevin swapped jobs and Kevin ran controls inside the dry lab. That person chooses what locations we are fishing and runs the operations when we do. He tells the people outside when to drop their baited lines, when there is a minute left before reeling them back, and when to “take them home.” Each of the three reels has a deckhand who radios when each step is complete such as attaching each hook to the line and lowering it to the bottom. The bridge is also in radio communication. There can also be some playful banter about who is not catching fish lately. According to the NOAA Fisheries Economics of the United States (2014) commercial fishermen in the Gulf of Mexico Region landed 1.1 billion pounds of finfish and shellfish, earning $1 billion for their harvest that year. In 2013, the red snapper fishery alone brought in a value of over $21 million dockside. On top of that, approximately 2.9 million recreational anglers fished in the Gulf of Mexico Region in 2014 as well. There are also fish-related industries that compound the economic effects of fisheries in the Gulf. The work that is being done is more than just understanding the ecology. Our gilled neighbors downstairs of NOAA Ship Pisces affect a lot of human lives too. It is refreshing to remember everything that is connected to our dinner. Today was a beautiful day on NOAA Ship Pisces. The wind was slight and the water was as close to mirror as I expect to see. Kevin told me that the geography of the Gulf makes for fast changing weather. It may storm up quickly, but it also means it calms down overnight too. No queasiness for anyone today! After another delicious and varied dinner by the talented stewards we were treated to a Man Overboard drill. It was entertainment to us, but serious practice for the crew. Lieutenant Noblitt and deckhand Junior were lowered in the ship’s Zodiac boat. On the other side of the vessel Ensign Rock was suited in a wetsuit & snorkel and jumped overboard as the person to rescue. After the lookouts on the Zodiac found her, Ensign Brendel jumped in for the practice rescue. Zodiac and crew getting back on the ship. Sometimes we get other neat things on board. Rhodolith (from the Greek “rhodo=red” and “lithos=stone”) are red algae colonies that build up upon older, dead rhodoliths over time. We also got dead man’s fingers. This is the common name for Codium sp. The crew of NOAA Ship Pisecs. Some people have asked me if it is an all male crew. Nope! Even two out of the six NOAA Corps are ladies. The emblem of NOAA Ship Pisces. The NOAA Corps is one of seven uniformed services of the U.S. What are possible paths to join and requirements? Do you need a college degree to apply? Yes, you need a bachelor’s degree in science or engineering. The only path is through the application process which starts with contacting a recruiter. NOAA Corps officers are always willing to work with interested applicants and are willing to give tours as well as to field any and all questions. When did you know you wanted to pursue this career? I decided I wanted to pursue a career with the NOAA Corps during graduate school when I realized that I desired a career path which combined my appreciation for sailing tall ships and pursuing scientific research. What is your rank and what responsibilities does that entail? I am an O3, Lieutenant; the responsibilities include operational management. A lot of day to day operations and preparation for scientific requests, ship port logistics, and some supervision. Operation Officers keep the mission moving forward and always try to plan for what is next. By supporting the scientists we are able to assist in enhancing public knowledge, awareness, and growth of the scientific community which ultimately not only benefits the Department of Commerce but the environment for which we are working in. There is nothing better then operating a ship. I enjoy the feel of the vessel and harnessing the elements to make the ship move how I choose. I enjoy knowing that I am working on something that is bigger than just the ship. This job is a microcosm of all the science that is going on around the world and knowing that we are contributing to the growth of the nation, well nothing can really compete with that. In all honesty, being away from family simply does get challenging at times. You are guaranteed to miss birthdays, special events, and even births of your children. Gratification comes from knowing that you are providing everything you can for your family. What tool do you use in your work that you could not live without? Now this is an interesting question; I would have to say there really is not just one tool as a NOAA Corps Officer we pride ourselves in being versatile. If it weren’t for the ability to use multiple tools we would not be capable of running and operating a ship. How many days are you usually out at sea a year? On average the ship sails 295 days a year. What does an average day look like for you on the NOAA Ship Pisces? You are living the average day. Day and night operations three meals a day and keeping operations moving smoothly, all this happens as the ship becomes a living entity and takes on a personality of her own. What part of your job with NOAA did you least expect to be doing? In the beginning and early on in a NOAA Corps career an Officer may feel underutilized especially in regards to their educational background when they are working on trivial duties, however with growth over time our scientific backgrounds serve us more than we realize. What’s at the top of your recommendation for a young person exploring a uniformed service or a maritime career? If you are seeking to travel and discover an unknown lifestyle at sea; being a Commissioned Officer is a truly diverse whirlwind of experiences that goes by faster then you realize. What do you think you would be doing if you were not working for NOAA? If I was not working for NOAA I would probably try working for a similar governmental entity, or even NOAA as a civilian, studying near coastal benthic (bottom of aquatic) ecosystems. What is your title and what responsibilities does that entail? Modern vessels require a team of technicians to run. Pictured here is part of the computer server on NOAA Ship Pisces. Operations and some equipment maintenance of position sensors, sonars, and software. You need to know water chemistry because you also take water samples such as temperature, depth, conductivity to determine the speed of sound. From that we can make sure the sonar is working right, so you need the math to make it happen. Pisces is different than some other NOAA vessels because it has a lot of other sensors. On some other NOAA vessels I have worked on there are also smaller boats that have the same equipment to keep in shape. You also need to analyze the data and make recommendations in a 60 page report in 90 days. What are the requirements to apply for this job? A bachelor’s of science in computer mapping, engineering, geology, meteorology, or some other similar degree. I was a project engineer for an engineering company prior to this. We did work on airports, bridges, etc. I retired and then I went back to work in 2009 and I’ve been working for NOAA ever since. I got involved with NOAA because I wanted to see Hawaii and I found a job on board a ship that would take me there. I’ve now worked in the Arctic, Atlantic, and Pacific. No matter which NOAA division you are working at it is integral to commerce in the country. The work we are doing here is important for red snapper and other fisheries. The work I did in the Bering Strait helped determine crab stocks. Ever watch Deadliest Catch? I got to play darts with the captain of the Time Bandit. There’s a different code for people who are mariners. You help each other out. I like that we get to go exploring in places that most people never get to go (in fact, some places have never been visited before), with equipment that is cutting edge. There are always puzzles to solve. You also meet a lot of different people. Working on NOAA vessels as a survey technician means keeping state-of-the-art equipment and software operational. Sonar picture of a ship wreck Todd mapped out. -Man versus self because you are pushed to your limits. Another challenge is missing my wife and kids. Since you are stuck on a boat, the biggest tool is to be able to deal with that through being friendly and having ways to occupy yourself in downtime. Work-wise, it used to be the calculator. Now it’s the computer because it can do so much. All the calculations that used to be done by pen and calculator are now by computer. Cameras are also very useful. Used to be 8 months out of 12. That’s tough since there is no cellphone coverage but some ships are close enough to shore to use them. The oceanographic vessel Ronald H. Brown went around the world for 3 years. I’m relatively new to this ship, but all ships are unique depending on what they’re studying. Each ship is a different adventure. When I was in Alaska training less experienced survey technicians in the Bering Strait, I got to see really neat stuff like being next to a feeding orca, atop a glacier, and got too close to a grizzly bear. What’s at the top of your recommendation for a young person exploring a maritime career? Stick with the science classes and you can never go wrong with learning more math. Imagine the size of the wave capable of getting the top wet! When bringing in a camera array today that was left out overnight, a huge wave crashed aboard all the way up to the top of the bridge. At that same time I was in my stateroom laying down trying to avoid seasickness. I could hear the metal moving, the engines running strong, and knew something interesting was happening. I almost went down to check out the action, but decided against bumping into everyone during higher seas operations and potentially really getting sick. What can I say? If you can not remember a word, at least be descriptive. NOAA operates the nation’s largest fleet of oceanographic research and survey ships. It is America’s environmental intelligence agency. The cameras are sent down 15-150 meters. It takes several crew, plus Joey “driving” inside the dry lab, to make each launch happen. Long line fishing is one way to gather fish population data. Another is remote sensing with camera arrays. The benefit of this is it is less invasive. The downside is it is more expensive and you can not collect fish samples. The goal has been to do ten-twelve camera array deployments a day. There are two camera arrays set up: Orthogonal Stereo Camera Array (OSCAR) and an array containing a 360 degree spherical view camera pod and a single stereo camera (Frank). OSCAR runs technology that has been used since 2008. There have been many incarnations of camera technology used for the SEAMAP Reef Fish Survey since 1991. The OSCAR setup uses four stereo cameras that capture single video and stereo pair still images. Frank uses six cameras that can be stitched together to give a full 360 viewing area. This work is used to determine trends in abundance of species, although there are a few years of holes in the data as the transition from catch to camera took place. OSCAR setup and the Frank setup (affectionately called that due to its pieced together parts like Frankenstein’s Monster) both run to provide comparisons between the different technology. One of the other devices on Frank is an Abyss by GoPro. NOAA scientist, Kevin works on making sure the Abyss is reading to attach to Frank. GoPros’ Abyss device may be a cheaper, off the rack option, but they do not do as well in low light conditions. Choosing gear is always a balance between cost and wants. For that you need to spend more for custom scientific equipment. Researchers are always working to stay current to gather the best data. This requires frequent upgrades to hardware and software. It also means modern scientific researchers must possess the skills and fortitude to adapt to ever changing technology. The ability to continually learn, troubleshoot, and engineer on the fly when something breaks are skills to learn. This is something all current students can take to heart. Together, camera arrays, vertical long lines, and fish trap methods give a more accurate view of beneath the waves. There are three different sized hooks used that rotate through the three Bandit reels. Another important science lesson is that zero is a number. There have been camera problems to work through and we have not been catching fish. Sometimes that zero is from equipment that stopped running. Those zeros are errors that can be removed from the data set. With fishing, we record if the bait is still attached or not, even if we do not catch any. It is always fun to put thirty hooks down and not know what is going to appear until we reel them up. It is also disappointing not to catch anything. Data is data. It is important for determining species abundance. I have enjoyed learning how to record on the data sheets, bait the hooks, de-bait the hooks (so there is always fresh bait), and a lot of little parts that are a part of the overall experience. When we are working, the ship goes to a predetermined location and stops. 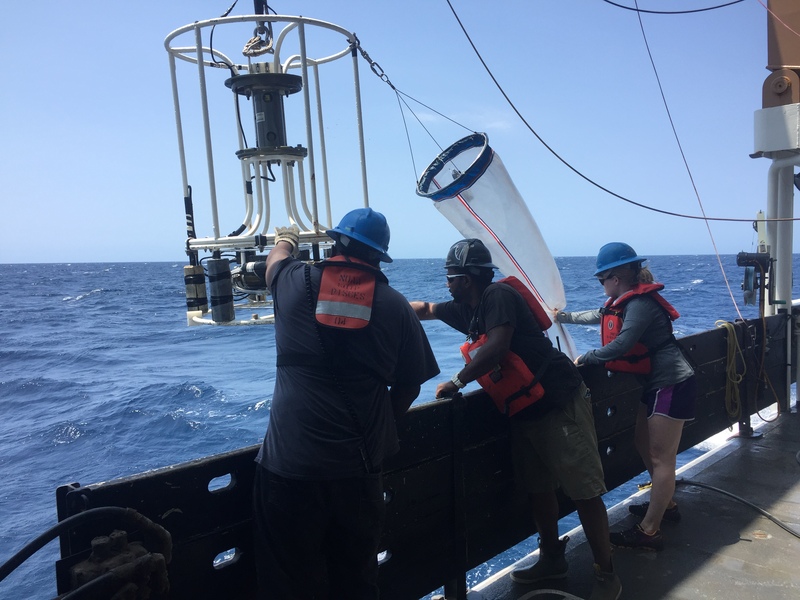 The CTD (conductivity, temperature, depth) Water Column Profiler is dropped in first (to be featured in a future post) then raised after data collection is done. Next either OSCAR or Frank goes down. Every few stops we also do the vertical long line fishing. The ship then goes on to the next stop, which takes about twenty minutes. That time is spent breaking down fish (when they are caught) and troubleshooting equipment. When on deck, hard hats and PDF are required when the cranes are running.